The upper extremities including the arms and hands have a big network of blood vessels called arteries and veins. The veins are thin-walled blood vessels that carry blood from tissues toward the heart and lungs, where oxygen is added, to be pumped and circulated back to the tissues through the arteries. The veins in the hands drain into the larger veins, which are in the arms, and into the shoulder and axilla, and back to the heart. The veins of the arms and hands are classified into superficial and deep veins. Those veins that are visible beneath the skin lie between two layers of a tissue called superficial fascia. Running parallel to their corresponding arteries, the veins lying deep in the tissues are called the deep veins. The small veins of the fingers and hands form a network at the back (or dorsum) of the hand. These small veins drain blood into two large veins called the cephalic veins and basilic veins.As major superficial upper extremity veins, the cephalic vein and the basilic vein are the blood vessels that usedfor PICCs—peripherally inserted central catheters. 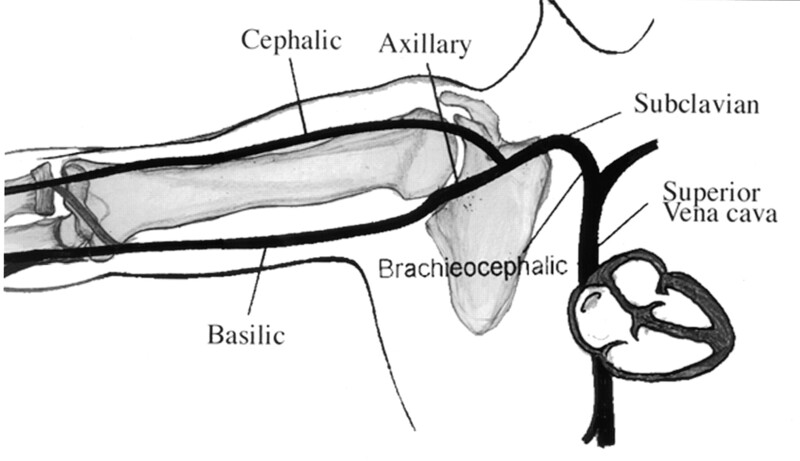 The basilic vein ascends into the arm along the medial aspect (the side running along the middle finger unto the axilla). It moves deep into the muscle of the arm and combines with another vein (the brachial vein) and ascends further to form an axillary vein. The cephalic vein ascends into the arm along the lateral aspect (the side running along the thumb up to the shoulder). It passes anteriorly (above) at the level of the elbow, whereit communicates with thebasilic vein through the median cubital vein. The cephalic vein travels along a groove at the shoulder between two muscles (deltoid and pectoralis major muscles) and enters the armpit (axilla), where it joins the axillary vein. The deep upper extremity veins are found beneath the tissues called fascia. Here, they are each paired with an artery. The largest is the brachial vein, which is paired with a brachial artery. You can feel your pulses from the arteries, which help pump the blood and aid venous to return to the heart. The superficial and deep veins are connected to each other through perforating veins. The upper extremity veins are named according to the areas they supply as they run along the length of the hand and arm. Thus, the deep veins consist of the radial vein, ulnar vein, brachial vein, axillary vein, subclavian vein, internal jugular vein, and the innominateorbrachiocephalic vein. The superficial veins consist of the digital veins in the fingers, the metacarpal veins in the hand, the cephalic vein, basilica vein, and the median vein. The deep upper extremity veins are susceptible to blood clot formation or thrombosis, which can cause blockage or occlusion to blood flow. This condition, called upper extremity deep vein thrombosis or UEDVT is a common condition that can lead to serious complications such as pulmonary embolism. Other complications that can result from UEDVT include disabling swelling and pain, and inability to gain vascular access for medical/surgical procedures and a condition calledsuperior vena cava syndrome. UEDVT can occur in people who do heavy tasks repetitively using the arms. Venous occlusion is more common in young individuals, but it can also occur as a complication of various medical procedures in the elderly, especially those using cardiac pacemakers or venous cannulation. The occlusion of the upper extremity veins can have symptoms like sudden onset of aching pain, swelling, discomfort, and heaviness of the affected arm. A bluish discoloration of the skin is also common. Treatment of upper extremity vein occlusion aims to open the occluded segment and keep it open. This consists of using anti-clotting medications (or anticoagulants) and medications to dissolve the blood clot (or thrombolytics). Once blood flow improves, additional therapy may be needed to avoid further development and future occlusion. This may involve a procedure called balloon angioplasty, which requires a patient to stay in the hospital for a few days. How Does Leukemia Affect the Body?